Stella Artois: so is it a Christmas beer or not? The lambic family of beers, consisting of lambic, gueuze, faro and kriek, has been making a remarkable comeback. Doomed to be extinct in the early 1970s, as drinks made for old men by old men, these beers from Brussels and surroundings were kept alive by passionate people that at first must have been regarded by locals as ‘quite crazy’. By now, their perseverance has paid off: today, lambic and gueuze are beer specialities highly coveted by beer lovers around the globe. 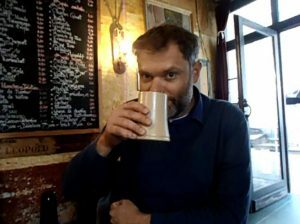 Apart from its unique taste and production process, there is also a certain mythology that adds to the appeal: lambic as a primordial beer from an ancient past. Lately however, beer connoisseurs are wisening up: not every aspect of the conventional lambic story stands up to scrutiny. In their enthusiasm for lambic, some writers have spread the weirdest tales. Not that I mind: these people were passionately promoting, even saving a very special beer style. Already, a writer like Jef van den Steen is slowly phasing out some of the less well-funded narratives from his books. But there still is a long way to go, and many of the old tales keep circulating. Which is why I’m presenting: eight myths about lambic debunked. 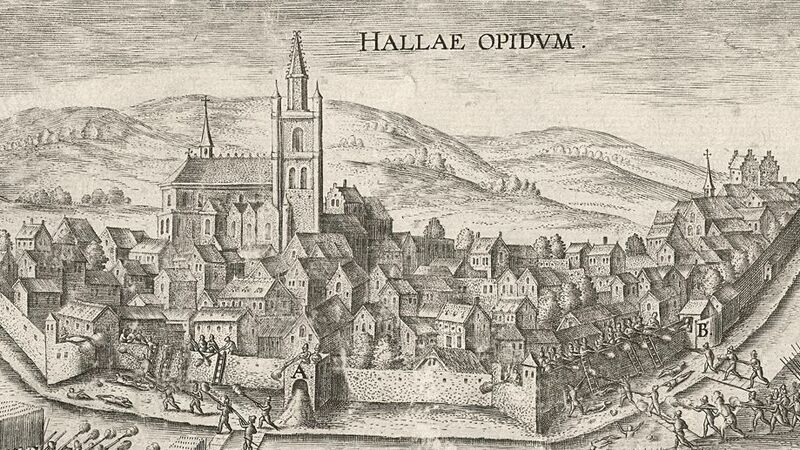 Myth 1: ‘Tax collector Remy le Mercier of the city of Halle wrote down a lambic recipe in 1559’. This myth started out in 1970, when Marcel Franssens wrote one of the first treatises on lambic as an endangered beer type that needed to be saved. The 1559 beer recipe is often cited as a proof that lambic existed as early as the 16th century, and that the amount of wheat in lambic has remained unchanged throughout the ages. Unfortunately, while the 1559 recipe is real, it is usually completely misquoted and misunderstood. First, it’s not a recipe for a lambic, the original text states specifically that it describes beers called ‘keute’ and ‘houppe’. In these we can recognise ‘kuit’ and ‘hoppenbier’, multigrain-beer types from Holland, more related to today’s white beer. Second, many writers claim the 1559 text specifies the same amount of wheat as is used today (about 30 to 40%). In reality, it talks about no less than 48.4% wheat, while it even contains 22.5% of oats, a grain never used in lambic, full stop. Forget about it folks, the 1559 text is not a lambic recipe. You get what this is supposed to imply: all beers were once spontaneously fermented, i.e. brewers didn’t add any yeast to beer and waited for fermentation to begin out of thin air. And lambic is the last beer made this way. However, this doesn’t stand up to scrutiny: surely, Medieval brewers recognised the enormous amount of foam coming out of fermenting beer? And surely, they knew that it was a good idea to start the next batch of beer with some of this fresh yeast, instead of leaving everything to chance? And that’s exactly what they did. In 1283, the chapter of Saint Paul’s in London sold yeast to smaller brewers, and in Belgium the city council of Tienen named yeast as ingredient for its beer in 1533-1534. Undoubtedly, other similar references can be found. Spontaneously fermenting in Brussels probably was an invention of the 18th or early 19th century; the earliest proof of this process that I know of dates from 1829. Brueghel’s peasants: they drank beer, but not lambic. It didn’t exist yet. Source: Kunsthistorisches Museum, Vienna. 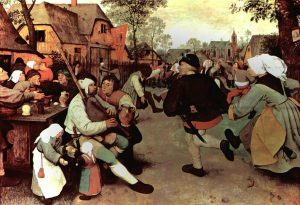 Beer writers like Michael Jackson have often suggested that somehow famous inhabitants of 16-century Brussels, like painter Breughel and philosopher Erasmus drank lambic. They didn’t: it didn’t exist yet. If they drank beers, which is probable, they probably were more into the ‘keute’ mentioned above. By the 17th century, the brewers of Brussels made beers called dobbel, braspenning and halfbraspenning, but still no lambic. 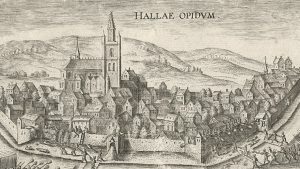 The earliest member from the lambic family to be mentioned in a Brussels context is faro, in 1721. 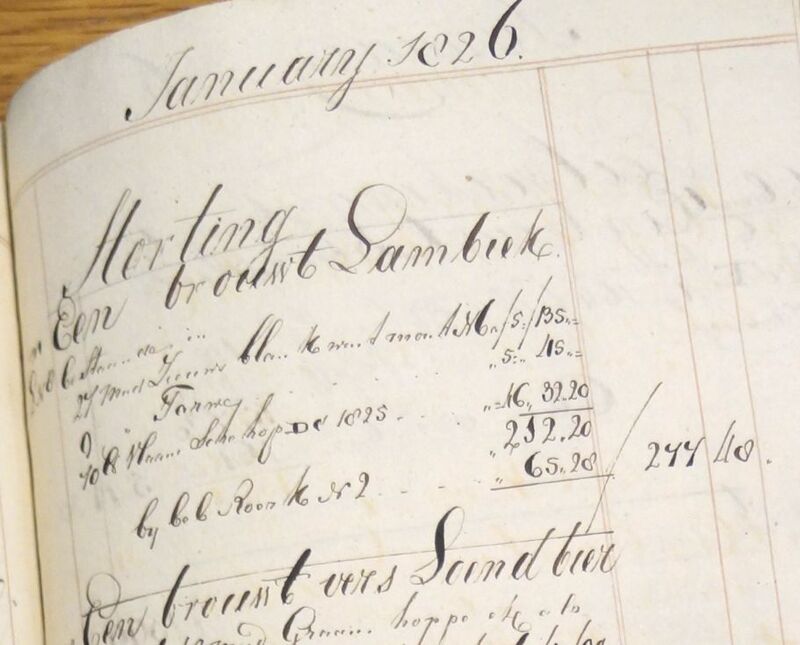 Lambic didn’t join the scene until 1794, and gueuze got its first name-check in 1829. There have been many attempts to explain the name ‘lambic’, some more convincing than others. Lambic has been read as a form of Latin ‘lambere’ (to lick), Spanish ‘el ambiguo’ (‘the ambiguous one’) or the name of the town of Lembeek. However, the oldest mentions of lambic beer, from 1794 onwards, speak of ‘allambique’ or ‘alambic’, and it kept the initial ‘a’ for another two decades or so. This indicates that the name derives from ‘alambic’, the French word for ‘distilling kettle’, originally from Arabic. The most probable explanation is that drinkers likened it to the product of the alambic, genever: high in alcohol (for the time), yellow and clear. The origin of the name ‘faro’ is shrouded in the mist of time (a beer of that name was known in Holland as early as the 16th century). I’ll get to the explanation of the name ‘gueuze’ in due time. 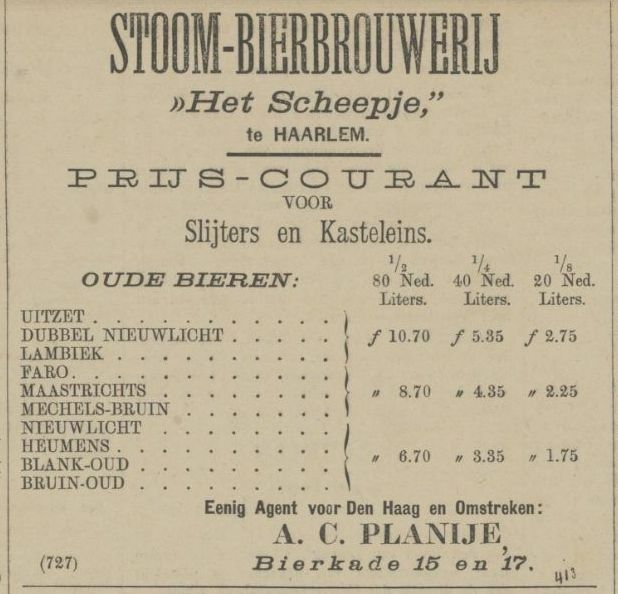 A 1883 price list for the Scheepje brewery in Haarlem (Holland), selling lambic, faro and some other Belgian-style beers. Source: Haagsche courant 2-6-1883. Gueuze: it was also sold in casks. Source: Musée de la bière, Schaarbeek. Today, gueuze is the name of bottle-conditioned lambic, sparkling because of its refermentation. However, some writers suggest that this use of ‘méthode champenoise’ always was gueuze’s defining trait. It wasn’t. There’s plenty of evidence of gueuze in barrels in the 19th and early 20th century, while at the same time lambic in bottles could still be called lambic, and not necessarily gueuze. In fact, gueuze started life as a name for the oldest and finest lambic, aged for as much as five years. Not all lambic was eligible to become gueuze: at the Vander Borght brewery in Brussels, in 1894 only 5% of all lambic was deemed good enough to be sold as gueuze. It was only after the First World War that gueuze in bottles became the norm, and that ordinary lambic disappeared from the market. Because of this development, lambic blending became the very tricky job it still is today: it was much harder to blend a quality bottled gueuze than a run-of-the-mill sweetened lambic in casks. Quite a lot is made of the fact that lambic is made out of wheat, today usually 30% to 40%. In the 19th century, that was even more: a 1829 recipe specifies no less than 58% raw wheat. However, at that time all-barley beers were only just starting to gain popularity in Belgium. 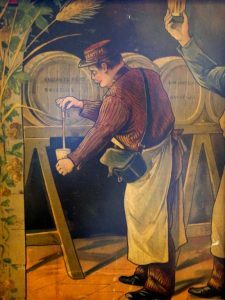 In fact, at the start lambic was quite modern for not having any oats, spelt or buckwheat in it, which were popular ingredients for Brabant’s white beers, for beers from Diest and Mechelen, and for the seef that was well-known in Antwerp. In Wallonia, the saison of Liège was known for its gratuitous use of spelt. Both the white beer and peeterman of Leuven and also the grisette of Hainaut couldn’t exist without wheat in it. I’d say it’s a matter of perspective: at first, lambic stood out for having only two grain types in it, only in the 20th century did it become special for not being an all-barley beer. Fresh Flemish hops used for lambic at the Scheepje brewery, Haarlem 1826. It’s what you always read: lambic brewers like to use old hops that have lost their aroma and most of their bitterness. It makes sense: hoppiness is not what the brewers are looking for. But for some reason, this was not always the case. A 1826 brewing log for lambic in Haarlem specifically mentions fresh Flemish hops from the previous year’s harvest, while for other beers, they used older hops. And lambic was hoppy: according to dr. Vrancken in 1829, the lambic of Brussels needed 2 pounds of hops per barrel, while only 2 ounces were enough for a barrel of white beer. 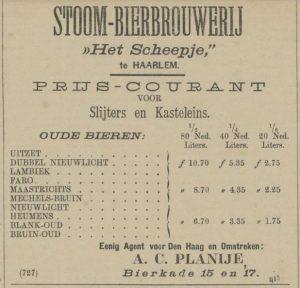 Brewery engineer Georges Lacambre specified in 1851 that for lambic young hops from Aalst were needed, while for March beer, older hops were good enough. I’m not sure what this means: I guess at the time they figured that first quality beer needed fresh hops. A modern-day equivalent would be Cantillon’s hoppy Iris beer. Want to know more? Just keep following this blog, or read the previous articles I dedicated to lambic and gueuze. Marcel Franssens, De geuzelambik, een levende historische getuige, Halle 1970. Roel Mulder, Verloren bieren van Nederland, Houten 2017. As researched by Raf Meert. ‘Lambiek is niet oudste bier van België’, De Standaard 27-2-2014; https://lambik1801.wordpress.com/2014/02/25/hals-bier-uit-1559-is-geen-lambik-deel-1/ and https://lambik1801.wordpress.com/2014/02/25/hals-bier-uit-1559-is-geen-lambik-deel-2/. Karl Hagen, The economics of Medieval English brewing, http://www.polysyllabic.com/?q=medieval/brewing; J.P. Peeters, ‘Bieraccijnzen en bierproduktie te Tienen op het einde van de Middeleeuwen en in de 16de eeuw’, in: Eigen schoon en de Brabander, jaargang LXX nr. 1-3 (januari-maart 1987) p. 1-26 en jaargang LXX nr. 4-6 (april-juni 1987) p. 155-180. Jean Baptiste Vrancken, ‘Antwoord op vraag 81’, in: Nieuwe verhandelingen van het Bataafsch Genootschap der Proefondervindelijke Wijsbegeerte te Rotterdam, Rotterdam 1829, p. 212. Paul Lindemans, Brouwerijen en brouwers van Oud-Brussel 18e eeuw. Uittreksel uit Eigen Schoon en Brabander 58/62, z.p. z.j. Michael Jackson, Grote Belgische bieren, Tielt 2006, p. 80-81; https://www.pajottenland.be/Data/Web/Versie2/geuze.php; https://www.horal.be/lambiek-geuze-kriek/oorsprong. Thierry Delplancq, ‘Les brasseurs de lambic. Données historiques et géographiques (XVIIIe S. – XXe S.) (1)’, in: Archives et bibliothèques de Belgique, part 67 (1996), nr. 1-4, p. 257-320. Jef van den Steen, Geuze en kriek. Het geheim van de lambik, Tielt 2011, p. 17. Some have read into this a legal confinement, but no such law existed. http://lostbeers.com/dutch-faro-and-lambic/; Noord-Hollands archief, Archief bierbrouwerij ’t Scheepje te Haarlem , inv. no. 198, 200, 201 Stort- en peilboeken. Tournée Générale, Canvas TV, series 1 episode 2 (2009). Vrancken, ‘Antwoord’, p. 207. He specifies equal volumes ofmalt and wheat, but wheat is heavier. See also https://lambik1801.wordpress.com/2014/05/21/een-eeuwenoude-verhouding-tarwe/; Meert cites his sources very sparingly. See the various recipes in G. Lacambre, Traité complet de la fabrication des bières et de la distillation des grains, part 1, Brussels 1851. For grisette, http://www.horscategoriebrewing.com/2016/10/what-is-grisette-part-ii-updated-and.html. Noord-Hollands archief, Archief bierbrouwerij ’t Scheepje te Haarlem , inv. no. 198, 200, 201 Stort- en peilboeken. Lacambre, Traité complet, p. 348. Another treasure trove of knowledge! “In 1283, the chapter of Saint Paul’s in London sold yeast to smaller brewers” – I struggle with reading the Latin of the Domesday Book of St Paul’s – do you have a page reference for that? On your Myth 2: what is the link between you saying yeast has been known by medieval brewers and spontaneous fermentation in Brussels being introduced only in the 18th/19th century? As we do not know by when brewers recognized the amounts of foam being useful (although being scientifically recognized much later) we probably still are poised to believe that fermentation has been spontaneous the centuries before. What makes you to believe Lambic has been introduced much later going back to the unpredictable and difficult process of spontaneous fermentation although a more secure and reliable method was already custom? Nice piece. I’ll have to read it a third time but I suspect that I agree with every word. The most important thing with lambic in my view is that the myriad subtle flavours that come from the slow re-fermentation have taken a considerable time to master in their balance and remain a bit hit-and-miss. The blending of cask lambics to make a gueuze has always struck me as the crucial art behind this. Kettle souring and other short cuts are never going to imitate that. Don’t assume “using a lot of hops” means “hoppy” – although it sounds like there could have been a one-off green hop harvest beer? AIUI “hops from Aalst” is effectively calling for Flemish Red Bine, a low-quality hop which is probably the ancestor of Tolhurst, a Kentish hop that flourished briefly in the early 20th century. Growers loved it for its huge yields, but brewers hated it for its low alpha (some analyses had it down to 2%) and lack of flavour. It did have relatively high beta acids though, so it was sometimes recommended for when you wanted preservative effect rather than flavour. I don’t know if you can still buy Red Bine, but Bushel of Hops harvest a kg or two of Tolhurst for sale every year – they’ve sold out this year.